When we hitchhiking up to Kokanee Glacier in Canada, we told our ride how we were going to Glacier National Park and he said, "Oh it's so beautiful there, you'll love it." We didn't understand, because we were already driving up a gorgeous mountain, embarking on the most beautiful hike we had been on so far. When we finally biked into the Many Glacier entrance to the park, we understood. The first real difference I noticed was the lack of fences and powerlines. They're so ubiquitous in our everyday lives, but even in the country they divide up the landscape into manmade straight lines. The lines long the road into Glacier were jagged and straight up, following craggy mountains that were bigger than any we had seen so far. And they were so close! They arose abruptly from shores of the lake, softer-looking at the bottom but transforming into hard, imposing cliff faces as the soil become too rocky for grassy carpets and trees. 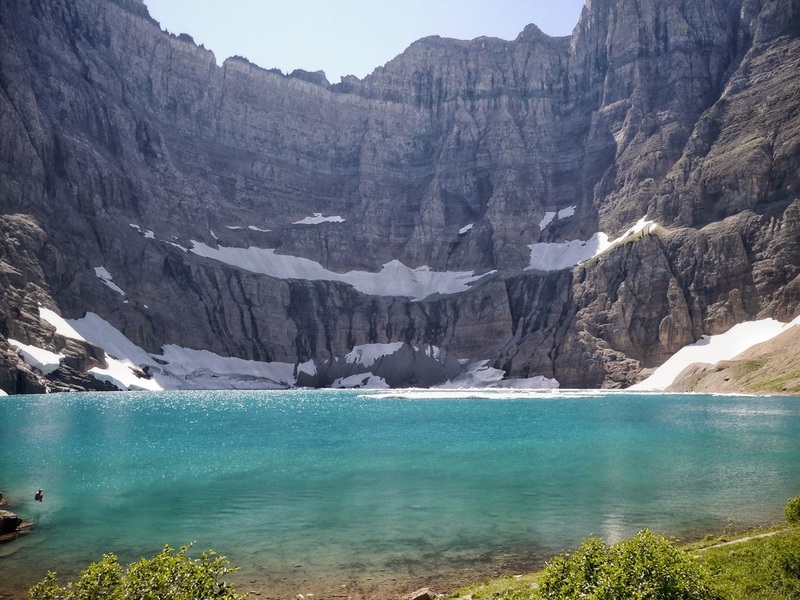 Because the campsite at Many Glacier is nondescript and surrounded by hiking trails, this area of the park attracts some intense outdoor enthusiasts. The campsite is already bustling at 6am as hikers prepare themselves for the day's adventure. Travis was awoken early by vacation energy, but he somehow contained himself like a child on Christmas morning waiting me to wake up at 9am. Even though he had already eaten some oatmeal he was manic with hunger, so I followed him to the lodge where he put a serious hurting on the breakfast buffet. The lady behind us in line commented that the bacon tasted like cardboard, but we were like, "Listen lady, we burned at least 5,000 calories riding up a mountain in a headwind yesterday. THIS BACON TASTES AMAZING." After we were sufficiently fueled we followed the signs to Iceberg Lake, a popular hike that lived up to its name. Even though it is late July, Travis learned that Iceberg Lake is not a euphemism. Take a look in the bottom left corner.